Thank you to everyone who came out to our March Happy Hour and to Danielle Murray for her fantastic update on all things local solar at Austin Energy! We enjoyed the interesting, information-packed happy hour and having the full house of attendees that this presentation deserved. In case you missed the presentation or want to review the content, Danielle Murray graciously provided us the slides she used so look no further! 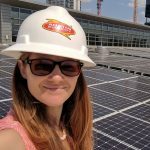 If you have any questions, ideas, or other things to follow up on please comment below or contact us at info@solaraustin.org.